Vegan Shallot And Vegetable Nasi Goreng. Hello friends, fancy making some Vegan Shallot And Vegetable Nasi Goreng? 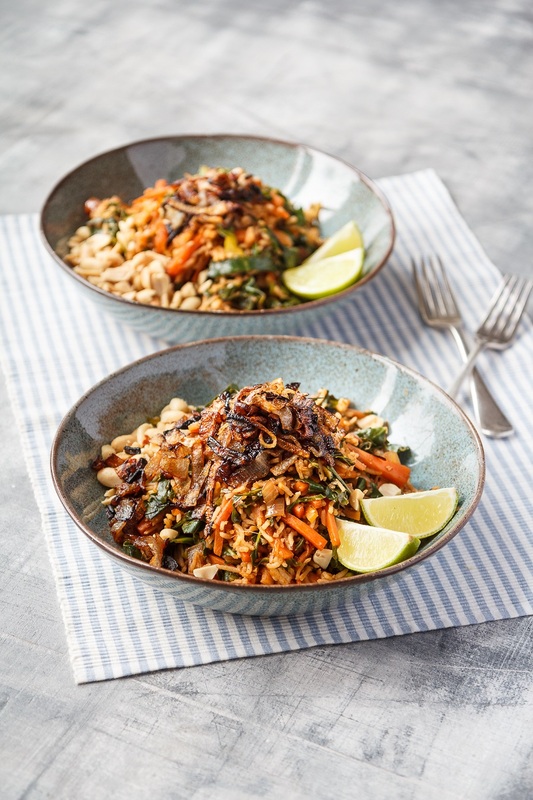 Vegan Shallot And Vegetable Nasi Goren- Fried rice is the perfect speedy comfort food, great on a Friday night served with a couple of cold beers. Use your favourite chilli sauce here -try it with sriracha or sweet chilli sauce or an authentic Indonesian Sambal Oelek sauce if you can find it. Heat the vegetable oil in a wok over a medium high heat and add the shallots. Fry for a good 15 minutes, stirring frequently, until they are deep golden brown, turning the heat down a little if they start to catch at the edges. Scoop from the oil with a slotted spoon and drain on a plate lined with a few sheets of kitchen paper. They will crisp up as they cool. Drain all but a tablespoon of oil from the wok. Set the wok back over the heat and add the garlic, stir frying for a minute until lightly golden. Add the shallots, carrots and ginger and fry for a further 3 minutes until the carrots are just starting to soften. Add the spring greens and keep frying for another 3 minutes. Stir through the soy sauce, ketchup, lime juice and chilli sauce, stirring well to mix through. Tip in the rice, season to taste with a little salt and pepper and stir fry for a final 3 minutes until everything is piping hot. To serve, spoon the nasi goreng into warmed bowls. Top each with a the peanuts and crispy shallots. Serve immediately with extra chilli sauce. What do you think about this Vegan Shallot And Vegetable Nasi Goreng recipe? Recipe and photo courtesy of UK Shallot. Socca Pizza With Prosciutto, Broccoli And Mozzarella Balls. Slow Cooker Pork, Shallot, Red Pepper Goulash. This is not one my boys would eat, which is a shame because it look so yummy! Claire, this looks amazing, and so flavourful too. Scheduled to share on the H&S FB page, pinned and shared around. Thank you for sharing, and for being a part of the Hearth and Soul Link Party. Have a great weekend! This is a beautiful bowl of goodness! Thanks so much for sharing with Full Plate Thursday and have a great week!